We all know the adage — The only thing that is constant is change. But how will you use it to your advantage? Will you lead that change or will it lead you? 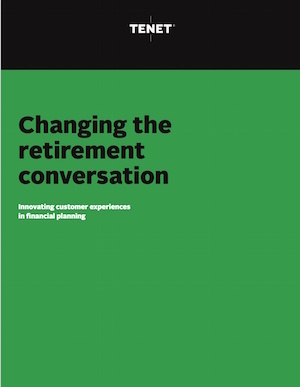 In our white paper “Changing the retirement conversation,” Tenet Partners takes a close look at how customer expectations, technology and the customer experience are changing all aspects of how Americans are preparing for their financial futures and what successful providers can do to lead that change. This evolving retirement landscape is creating new challenges for marketers and product managers. Passive investment strategies are on the rise and to the consumer, it can be hard to distinguish one provider from another. Innovation plays a pivotal role in setting a company’s brand apart. Companies need innovation to sustain competitive advantage and long term performance. For the past decade, Tenet Partners has worked closely with both consumers and providers to build experiences and brands at the forefront of the changing retirement landscape. What creates a successful innovation approach? What role should technology play? Where will disruptive innovation come from? Learn how to use our insights to strengthen your customer relationship in a way that drives loyalty and captures a larger share of wallet.